Love Varnish: Swatches & Review & Nailart - Cirque Colors The Metropolis Collection February release! Hi loves! Today I have the newest addition to the Cirque Colors Metropolis collection to show you, each month one or 2 creme shades inspired by New York City are added to this collection. I always love reading up on the inspiration and obviously the perfect cremes are a nice touch as well ;-). Let's take a look at Cirque Colors Doyers! Like I said, all colors are inspired by New York City but to me, Doyers didn't ring a bell immediately. But, Google helped me out and informed me Doyers Street is a 200-foot-long street in the heart of China Town. The shade of red pops up a lot so I guess that's the link ^^. The formula on this shade was a tad thick, though very smooth and self-leveling. It didn't dry particularly glossy, which is why I helped it a bit by using the Essence Gel-look topcoat - doesn't it look plump? 2 coats were barely needed for opacity, 1 coat might be enough on shorter nails. While I loooove red, people might think it's a bit close to Cirque Colors The Devil Wears Cirque. It isn't a dupe, but yes, there's some resemblance. Emily from Very Emily compared them for you! To spice it up a bit, I decided to use some Born Pretty Store rhinestones. They came in a little pot and hold 4 different sizes of rhinestones (1.5mm/2mm/3mm/4mm). They are all silver/clear, with a flat back. To apply them I just pushed them down in my wet topcoat. If you want to check them out, you can do so here. I think they look really fancy against that red base! What do you think of this look? Is it something you'd wear? Tell me in the comments! Cirque Colors is sold through their own website. The Cirque Colors Metropolis collection retails for $13 per bottle, worldwide shipping available. There are also various stockists selling Cirque polishes so be sure to check if you can shop more locally, too. Flawless swatch!! I am absolutely in love with the rhinestone placement you did <3 and thank you for the mention hehe! 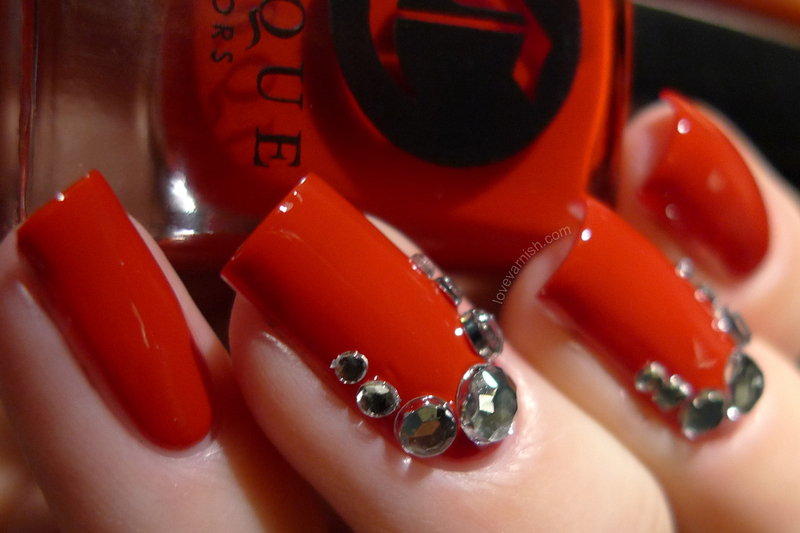 A gorgeous classic shade, and those rhinestones are perfection! Flawless red creme. Those rhinestones are the perfect finishing touch, kind of like diadems on queens. Beautiful red, tho I suspect it's a bit warm for me. I do love the bling! Your photos look flawless! I sure do love a good red! 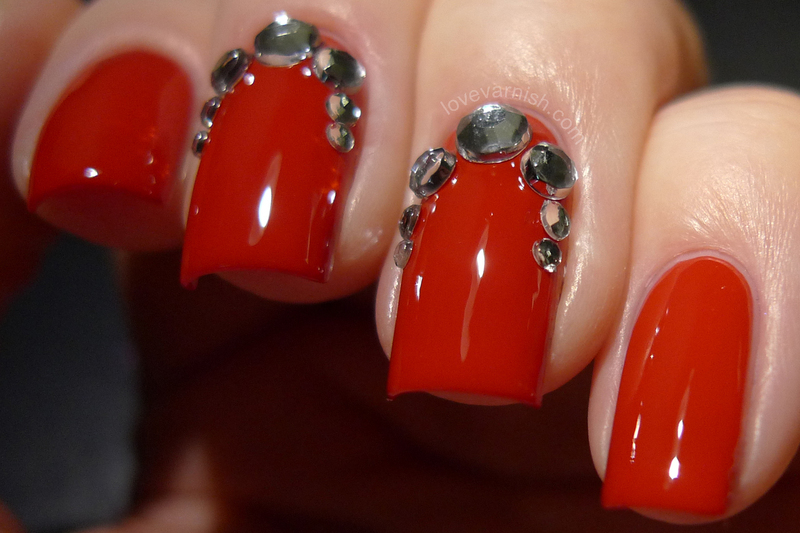 What a great combo with the red and rhinestones! I'm so in love with this color and it looks fabulous on you! so gorgeous - I am obsessed with the rhinestone ruffian! OMG it's perfect! I need Doyers - I have nothing like it in my collection so clearly I should be ashamed of myself. This is absolutely beautiful! Love the added touch of glam! this is so pretty! perfect is every way! 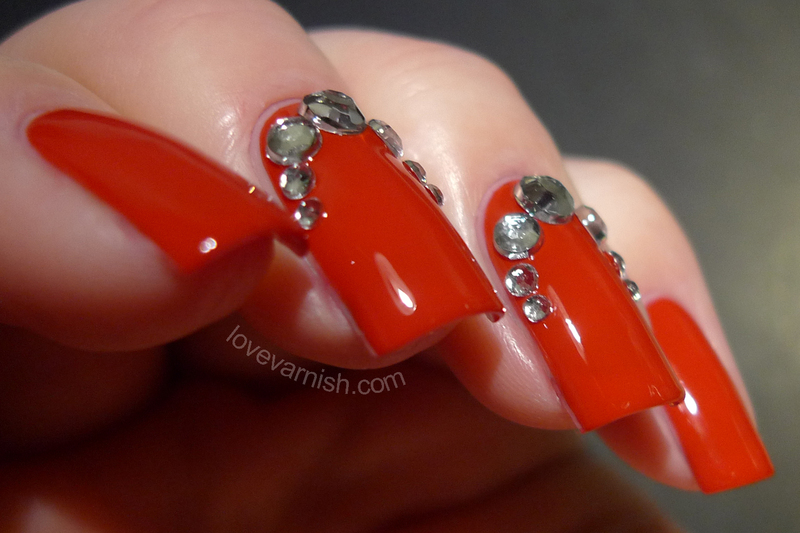 This is a really great shade of red, I love the rhinestones too! That's a classy red and I love how you glammed it up! Beautiful color. I really like the placement of the rhinestones. You've got to love the perfect red nail polish. This one looks like it might be perfect if it wasn't for the thick formula. I really like the way you added the rhinestones too. Very unique placement. I love your photography skills! The rhinestones compliment the shade so well. Love this. Wow, these are beautiful!! I love these! I just got this shade, can't wait to try it on! It looks gorgeous on you!! Love the look with the rhinestones! It's a pretty red, but I think it leans a bit too orange for my skin tone. It looks lovely on you, though, and I love those rhinestones! It looks so flawless!!! I'm digging the color...not sure if I have anything like it! 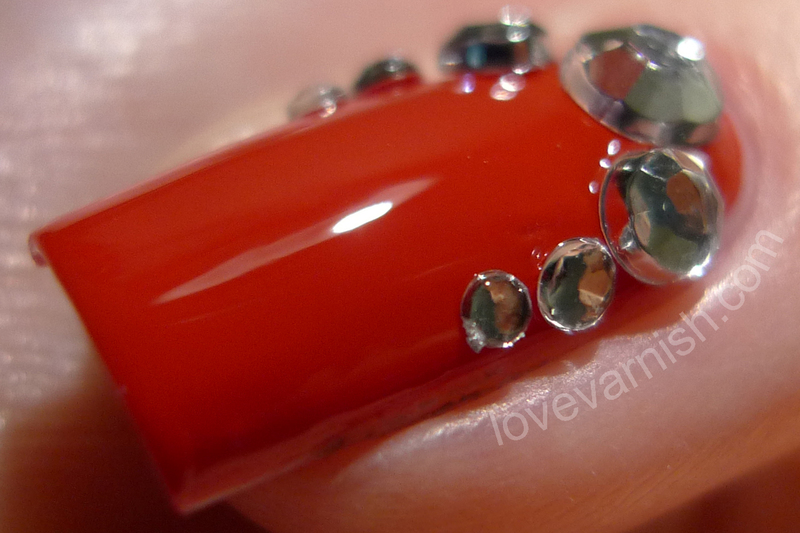 Wow - it's a perfect red and with the rhinestones it looks drop-dead gorgeous! No worries, I loved your post! And thanks, I kinda winged it, wasn´t too sure at first but now I really like it :). Thanks Krystal! You can never go wrong with a red like this. If you need a less warm red, Cirque The Devil Wears Cirque might be your thing! Thanks :). It was a design I had never seen or done before, but I like how it turned out! Thanks! It came out quite amazing huh? Everyone needs a staple red and this is a lovely one! Thanks Paulina! The inspiration behind the shades is so much fun :). Thank you Julie, I loooove reds like these ^^. Yes it might be better with a slight use of thinner, other than that it's perfect. And thanks! I don't really work with rhinestones all that much but this came out so classy! Thanks so much, that really means a lot to me :). Aaah, hope you liked it as much as I did! Yeah it's quite warm in tone, so it might clash. Thanks Katherine.